You all — especially our Patreon supporters, whose requests we take very seriously! 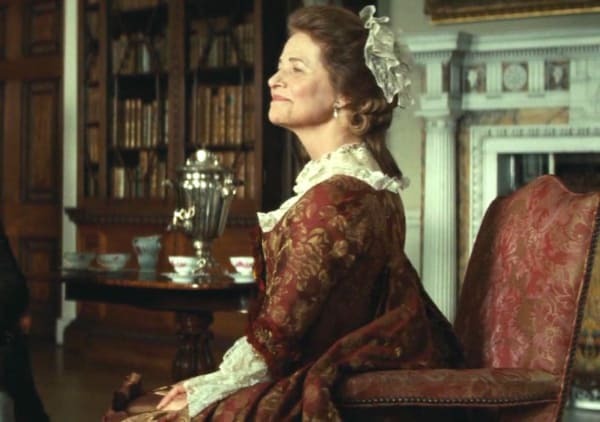 — have been asking for an in-depth review of The Duchess (2008) for a while now, but I’ll admit to being overwhelmed by the prospect. There’s a ton to unpack, both in terms of plot and character, but also in terms of costumes, costumes, costumes — designed by Michael O’Connor. Luckily Trystan came up with a great idea, which is that I discuss the film one costume at a time. 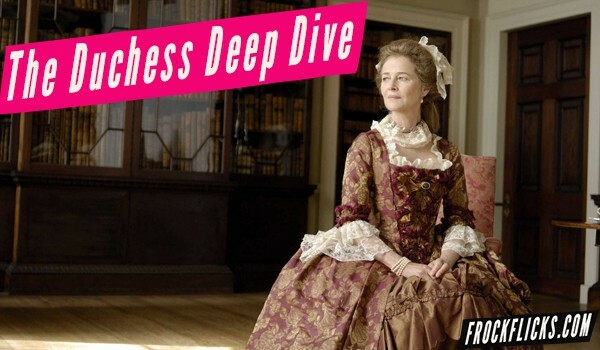 So, here’s a new series: The Duchess Deep Dive, in which I will go through the movie, one costume at a time, focusing on those worn by the principle female characters. 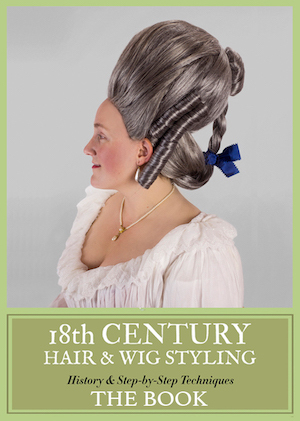 I’ll be talking about the costume itself, as well as hair, makeup, and accessories, both how they work in the film and how they compare to real fashion of the 1770s-80s. For a quick overview of what I thought of the film, you can check out my short review. At some point in this process, I’ll take some time out to talk about how well they got the history right or not. I’m going to refer a lot to the first post in this series, where I review Georgiana’s first gown, so take a look at that if you haven’t already! 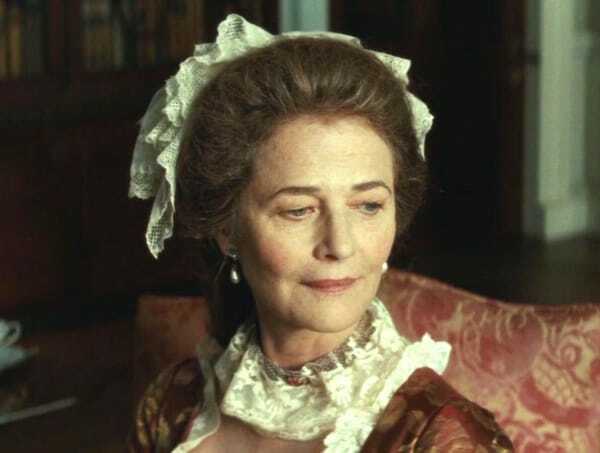 Georgiana’s mother, Margaret Georgiana Spencer, Countess Spencer, played by Charlotte Rampling (Henry VIII and His Six Wives, The Wings of the Dove, Great Expectations), is one of the other two major female characters whose wardrobe I’ll cover in this series. In 1774, the year the film begins, she would have been only 37, much younger than portrayed in the film. Nonetheless, she’d been married for twenty years with five children, so it’s appropriate that she’s dressed more conservatively and maturely than her daughter. 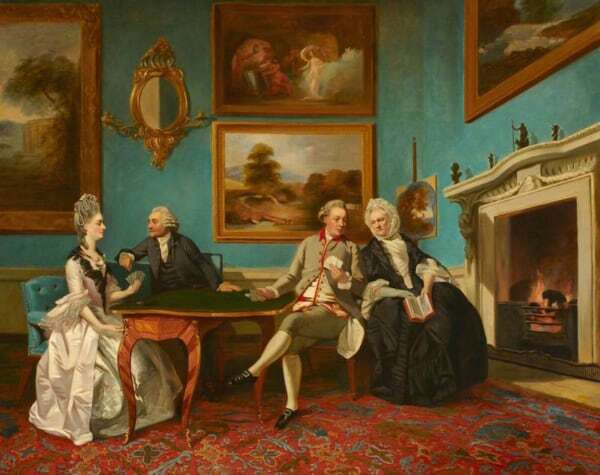 Countess Spencer wears a robe à la française, more usually called a “sacque” or “sack” in England. This was the leading style of dress worn for formal occasions from the 1740s through the 1770s, so it makes sense that she’s wearing this for the oh-so-important moment when she arranges her daughter’s marriage to the Duke of Devonshire. The dress follows nearly all the correct style lines for the era. The gown is open in front over a stomacher and petticoat, although technically the bodice edges (at about her side bust point) should be pleated in what are called “robings.” The sleeves are the right length, and while it would be more usual to see a self-fabric cuff that gets longer in back, there are lots of sources that point to updating your sleeve and cuff styles in order to follow the fashions of the day. 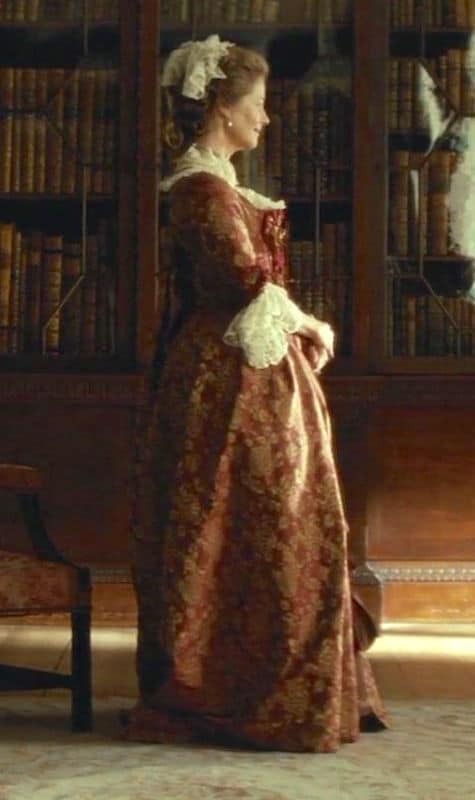 From the front, it’s unclear whether this gown is a sacque or nightgown (the fitted-back style worn by Keira as Georgiana in the same scene), because they can look pretty much the same in this period. It’s the long, double-box-pleated back that gives the sacque it’s look and name. And no, they didn’t fake things by making a separate cape-y thing like many do (I’m looking at you, Amadeus and Outlander). The silhouette is right — worn over small side hoops (probably individual pocket hoops). Hoops were at their widest around the 1750s, and this narrower silhouette is perfect for non-court wear in the 1770s. The main things to discuss in the Countess’s ensemble are the fabric and trimmings, since they got the classic cut and style of the dress right on. And here we go: I’m not sold on the fabric, guys! 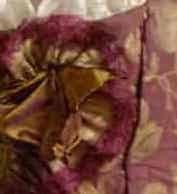 Okay, there’s nothing offensive about it, it’s fine — it’s got a woven floral pattern that’s naturalistic, which is typical of the 18th century. But while of course you can find all kinds of colors in any era, this particular burgundy and tan just reads as (modern) furnishing fabric to me, and doesn’t speak to the 18th century aesthetic — which no, was not all light-colored florals; in the first half of the 18th century, dark colors and heavy patterns were indeed fashionable. 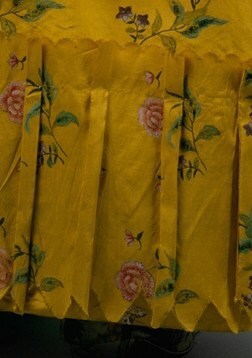 The scale and color of the Countess’s dress fabric is much more 1700s-40s than anything else. 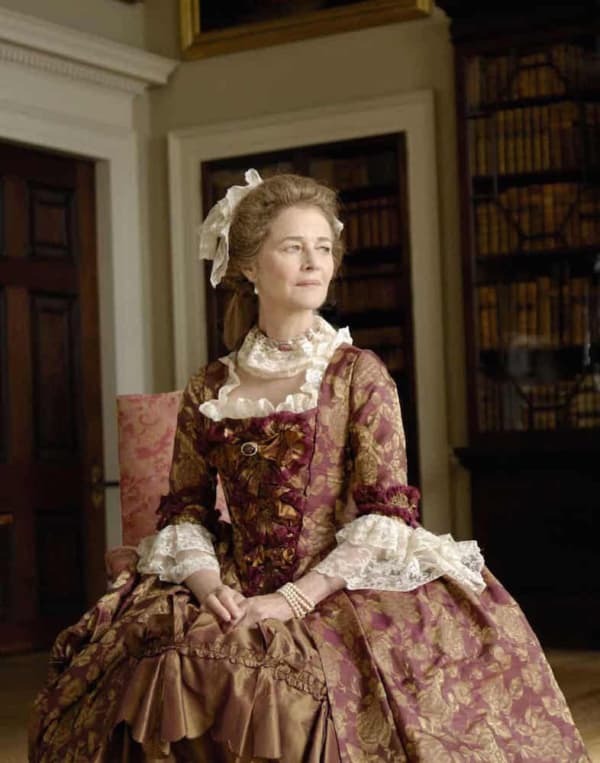 Now, 18th century people, including the upper classes, very much took older gowns in older fabrics and remade them. You see lots of gowns in museums that were originally made in, say, the 1730s, and then remade in the 1770s or 1780s. Textiles were incredibly valuable, so reuse made perfect sense. It’s just… meh? 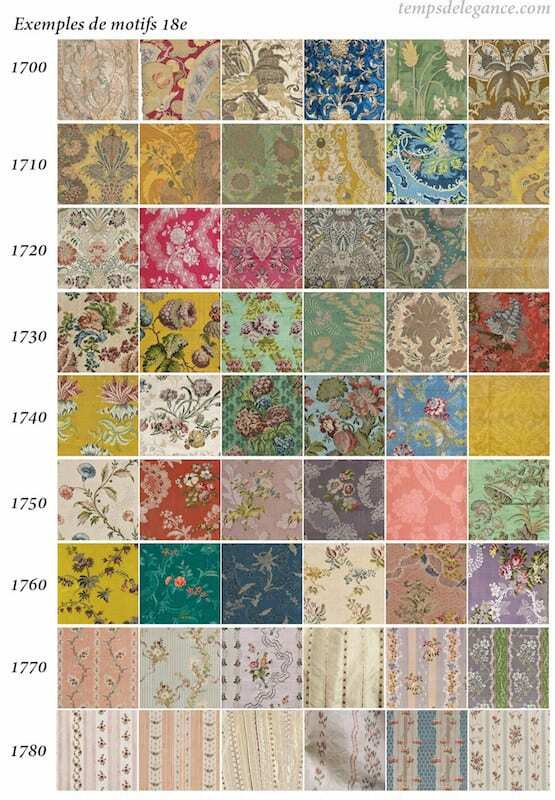 I did some noodling around in the Victoria & Albert Museum’s online collection, and here’s the closest I could find in terms of color and pattern; it’s closest to the earliest example. 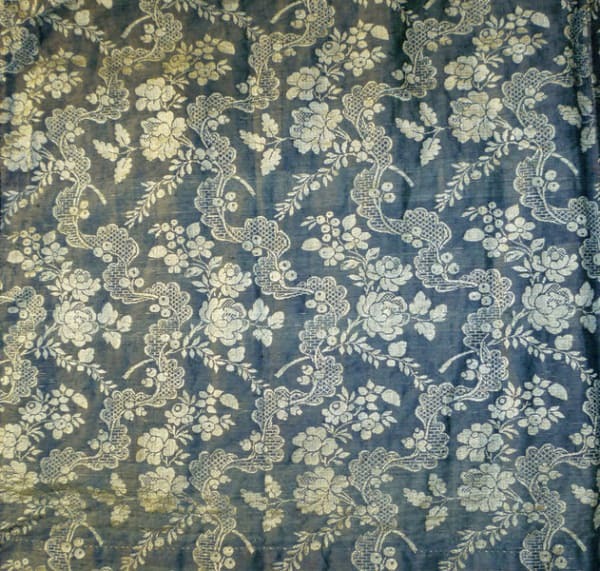 Dark background with large, light-colored flowers and greenery | Dress fabric, c. 1733, Victoria & Albert Museum. 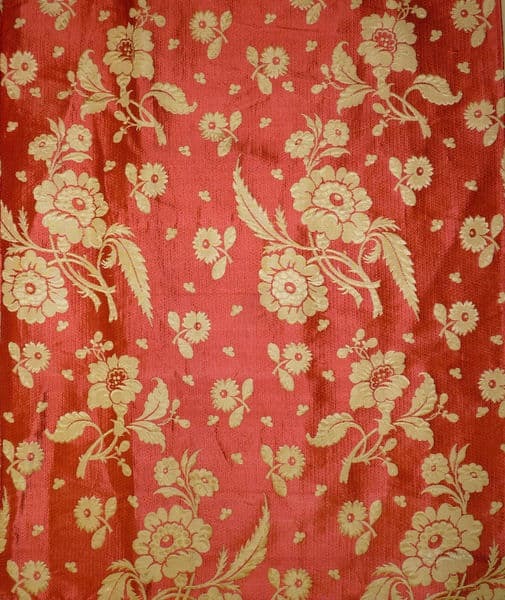 A stronger color but still in the same family, especially the flowers — which, on the other hand, are much smaller and more widely spaced | Dress fabric, 1740s, Victoria & Albert Museum. 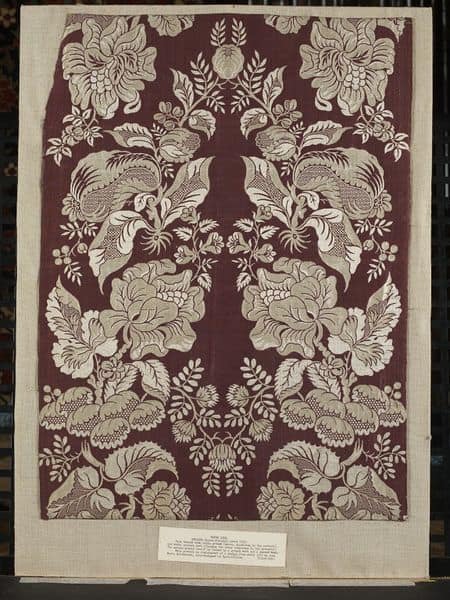 Okay, so I guess roses are acceptable, although notice the lace and wavy/stripey pattern | Dress fabric, 1770s (weaving) – 1780s (sewing), Victoria & Albert Museum. And what about that self-fabric, ruched, frayed-edge trim? I was all set to give it a pass, as I’ve certainly seen LOADS of 18th century dresses trimmed with gathered or pleated strips of self-fabric. But then I started wondering about the fringed edge, which you get as the fabric unravels at the edges, and contrasting color is often used in film costumes. Basically, there’s more than one thread color in the fabric, and each is going a different direction (some vertical, some horizontal), and allowing the fabric to fray means you get just one of those thread colors on the edge. The fabric wouldn’t fray this much on it’s own, so someone must have manually fringed it. Which looks super cool! But now that I think about it, it’s not something I’ve really seen on extant gowns! 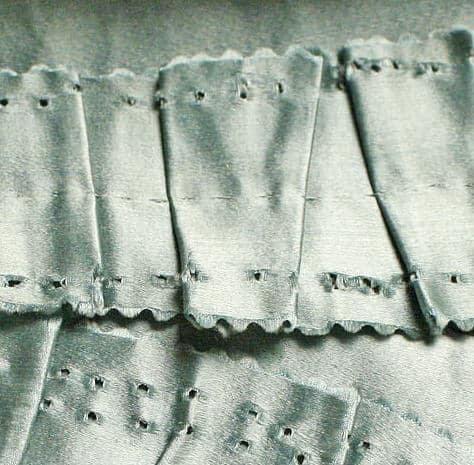 Most gowns with self-fabric trimmings have the edges of those trimmings hemmed or stitched down, with or without braided trim (“fly fringe”) on top. Sure, some do have scalloped/pinked edges, but that’s usually cut with a clean line, probably due to a combination of tighter woven fabrics than we currently have, and treating the edges with something like gum arabic (the period equivalent of fray-check). 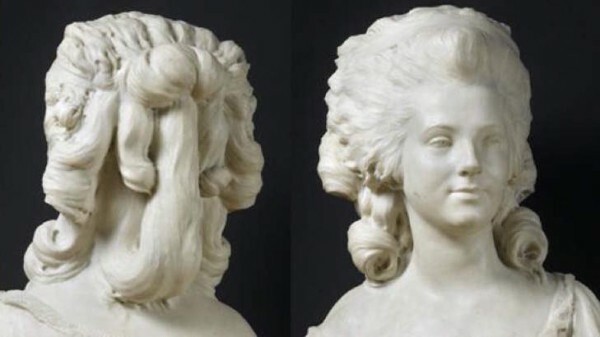 Just like in Keira/Georgiana’s first ensemble, the hair is rounder than the mid-1770s style, although the back of this hairstyle ROCKS LIKE NOTHING ELSE ROCKS. SOOOO many hair designers fudge the back of 18th century hairstyles, so this movie makes my toes twinkle. 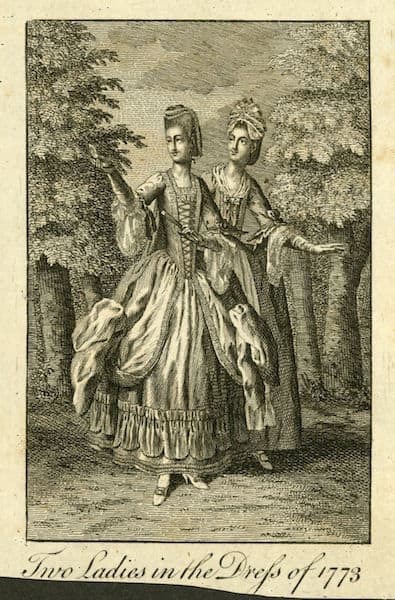 Also, the lace cap and ruffled lace around her neck are very à la mode for 1760s and earlier, and definitely seen on older ladies in the 1770s and 1780s. 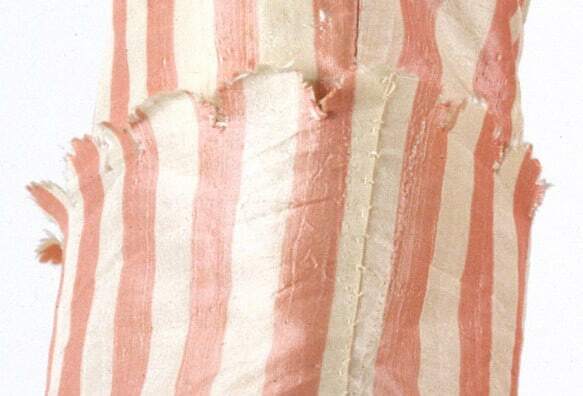 Have you seen any consciously frayed pinked edges in 18th century fashion? What do you think of that fabric? The fabric doesn’t seem very accurate to me. The flowers are too 3-dimensional and realistic looking and the (what looks like a) trellis pattern make it look more post-18th century. But given how difficult it is to find period-appropriate brocades I think it’s fine for a movie costume. 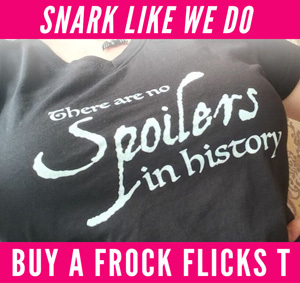 I agree — it looks like a very “movie” choice vs. a historically accurate fabric choice. It’s close enough to give a period aesthetic, but it’s not strictly of the time. And it does something relevant for the character, showing Mom as older, blending in, of the past, & not a ‘bright young thing’ like her daughter. Which makes sense as throughout the film she is cautioning Georgiana with “traditional” marriage values in opposition to Georgiana’s romantic ideals. The blue swatch with the waves reads very chinoiserie influenced to me. I’m kicked out of the comments one day out of two, but I ADORE these! Keep up the good work! Heart eyes for this deep dive series—I’m trying to learn more about 18th-century design for a writing project, and this is a great reference point. Thanks!